Top Syrian rebel commander Abdul Qadir al-Saleh has died of wounds he sustained in a government air strike on a rebel-held air base near Aleppo on Thursday, reports say. Abdul Qadir al-Saleh, the leader of Liwa al-Tawhid, died overnight, a spokesman told the Associated Press. Abdul Aziz Salama, the brigade’s political leader, had assumed overall command, the spokesman added. Opposition activists had said Abdul Qadir al-Saleh, also known as Hajji Marea, was in a good condition in hospital last week. 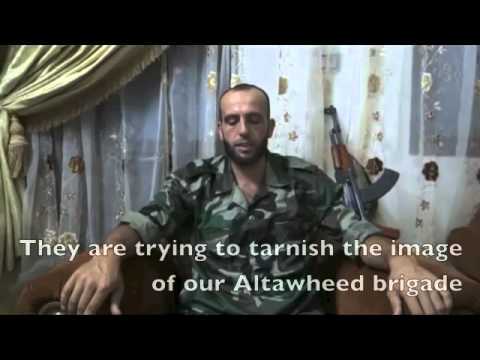 Liwa al-Tawhid (Battalion of Monotheism) was formed in July 2012 to unite the many separate fighting groups operating in the Aleppo countryside. Later that month, it led a rebel offensive on the city of Aleppo. Liwa al-Tawhid is now one of the main forces operating in the province, and is estimated to have between 8,000 and 10,000 fighters. In January, it joined the Syrian Islamic Liberation Front (SILF), an alliance of Islamist rebel groups that recognizes the Western-backed Supreme Military Council of the Free Syrian Army but not the National Coalition.